The Trump administration says it's canceling $929 million in federal grant funds meant to help pay for California's High-Speed Rail project... and it wants the $2.5 billion that the state's already spent on the project back. The Department of Transportation announced the move on Tuesday. The agency said it's "exploring every legal option" to figure out how to get the $2.5 billion. The head of the Federal Railroad Administration said in a letter that the funds were being canceled because the California High-Speed Rail Authority failed to comply with the terms of the agreement and didn't make enough progress on the project. Gavin Newsom's State-of-the-State address in which he said the high-speed rail project would be scaled back. The plan has already faced cost overruns and delays. 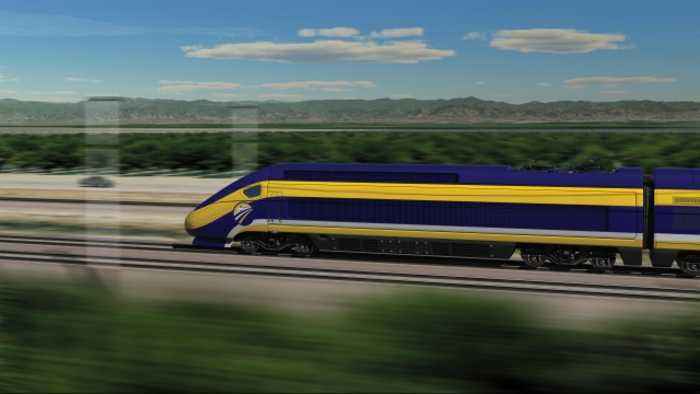 The goal of the project is to connect San Francisco and Los Angeles with a bullet train. Last week, President Donald Trump called the project a "'green' disaster!" and demanded that California return the $3.5 billion in federal funds dedicated to it. But Newsom said he'll fight to keep the money for the project. He said that the Trump administration's move was in response to California taking part in a lawsuit challenging the president's national emergency declaration to pay for a U.S.-Mexico border wall.